I’m so happy to announce that I will be co-leading the first retreat hosted by Viveka Yoga, my home away from home in Lachine. 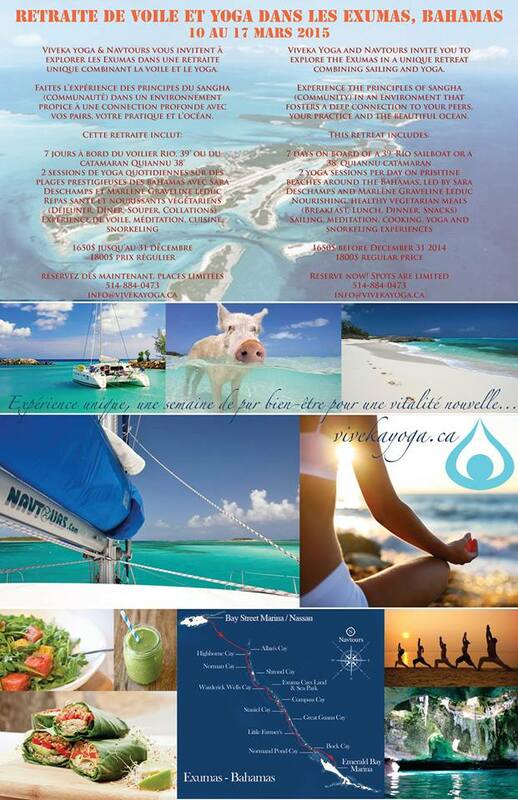 From March 10th-17th 2015, The wonderful Marlène Graveline-Leduc and I will be sailing away with a group of sailors/yogis to explore the Exumas in the Bahamas. Marlène and I will be offering 2 yoga classes per day, on different beaches in the Exumas. We will also be offering vegan food and cooking workshops, meditation sessions, and the chance to connect to a powerful community while sailing the open seas! If you are interested in joining this adventure and becoming part of this community, please get in touch! Spots are extremely limited! I see so many parallels between yoga and sailing – living in the moment, letting go of control, listening to your intuition. Living on a sailboat for 7 days will also be an incredible experience in sangha (community) as we share food, share space, and share bathrooms…! I feel so fortunate to have been given the opportunity to share my passions with a group of people in such an exotic locale, and I’m also looking forward to a little digital detoxing. Disconnecting from social media and emails, and connecting to the ocean and sandy beaches will definitely be welcome! Let’s escape winter together! Mark your calendars for March 10th-17th 2015, and get in touch with us to reserve a spot!